Essential oils can help with a wide range of daily issues - from better sleep, bringing down stress or anxiety, improving focus, to more physical actions like helping to heal a cut, burn or bite, or reducing inflammation. ZEN BOX delivers three new essential oils monthly (plus quarterly bonuses). The special limited-time offer is a free quality Frankincense essential oil at sign up plus 25% off for life. 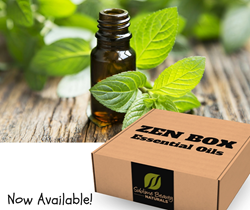 "We want to reward the early ZEN BOX subscribers," says Kathy Heshelow, founder of ZEN BOX and Sublime Beauty Naturals®, "and help many discover the natural power and joy of essential oils." ZEN BOX is $39 monthly, but with the special offer is $29.25 monthly. April is the quarterly bonus month, so a 4th item will be included in the box. Use code 25FRANKLIFE at checkout, and be sure to hit the "apply" button under the coupon before checkout at the ZEN BOX purchase site. A limited amount of coupons are available now. An instructional sheet with HOW TO tips and essential oils profiles are sent monthly at time of shipping, and various educational emails are provided as well as the content site of information, which includes safety tips and helpful posts. Essential oils can help with a wide range of daily issues - from better sleep, bringing down stress or anxiety, improving focus, to more physical actions like helping to heal a cut, burn or bite, or reducing inflammation. Essential oils are extracted from plants and are the "life blood" that hold important benefits for wellness. They have been used for centuries. Frankincense is a favorite essential oil of many people today - and throughout history - for good reason! It has a wonderful scent and powers for wellness with different situational uses. Frankincense supports reflection and can help to quiet the mind and bring tranquility and quiet.. Frankincense promotes healthy cell regeneration and keeps existing cells and tissues healthy. It also can aid in the oxygenation of blood. Frankincense is wonderful added to skin creams as it helps with regeneration of skin cells. It is certainly an anti-inflammatory, antibacterial and analgesic. This is a nice essential oil to diffuse to clarify the air of microbes but also to create a tranquil environment in the home. An information sheet will be sent about Frankincense to those who subscribe. Anyone new to essential oils and starting use should refer to the Safety First guidelines found here. ZEN BOX subscribers will be helped in the discovery process. ABOUT: ZEN BOX is from Sublime Beauty Naturals®, whose motto is "Make Healthy Choice, Respect Your Body, Love Nature." Heshelow founded the companies, and lived in Paris for 16 years where essential oils are commonly used and accepted in the medical world. Her new book, "Essential Oils Have Super Powers®" is due out in late April.